BigChurch is where Christians and other faiths can go to find friendship and love with others. They provide a simple range of tools and features to help you search for a soul mate and make new friends. 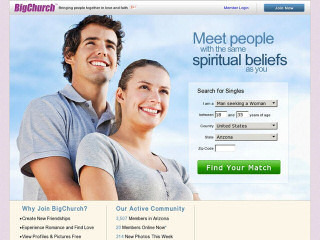 BigChurch says it's for spiritual singles so we take that to mean they welcome any faith. Their mission is to bring people together for friendship, dating, romance and of course marriage. You can create a basic account for free by completing the short join form. After adding some basic details about yourself, and confirming your email, you'll get immediate access. Inside, the layout is simple and easy, yet effective. It is a Friendfinder site and has a standard yet functional design. To get started you will probably need to adjust the settings on your profile page. At the top of each search page you'll see a link to change your dove preferences. This lets you specify the kind of people you'd like to meet. It lets you set all of the important things like their age range, distance from you, and of course their gender. Click to update and you're all set. Once that's done your searches will stick to your preferences and display people who you're interested in. They'll also notify you by email if any new members turn up who are a good match. When you view another profile you'll be able to see how compatible they are with you and vice versa. The second thing to do is add a good photo or two. While it isn't compulsory, you'll get far more responses and are more likely to receive replies if you show at least one photo. Pictures can be set to public or private. Members will need to ask your permission first before they can view your private photos. BigChurch isn't exclusive. It's for people of any religion, any faith. The standard account that everyone starts with doesn't let you do very much - annoyingly it won't let you view full profiles or let you send messages. Only after you choose to upgrade membership to Silver or Gold for a fee do you get privileges such as full communications and the ability to view photo profiles. Other bonuses include priority listings in profile searches, ability to view videos, viewing the newest site members and initiating contact with your prospective matches. In addition to the personals section there's a host of other activities. There are chat rooms for discussion and a Bible verse search. Overall BigChurch is a secure venue if you're looking to find others who follow a certain faith. It is easily navigable with simple features meaning you don't need to be technical or computer savvy. Rss Feeds. Subscribe to comments for this site. [?] Receive updates about Bigchurch.com directly through your newsreader. am a converted christian, i need a believer to relate wit urgent!! cos der things still find shakie and bigchurch U are all reaching million and touching lives. Actually I am a converted Christian, I need someone to teach me better about Christianity and life, and who will care me better. BigChurch 3 3 A review of BigChurch. BigChurch is where Christians and other faiths can go to find friendship and love with others. They provide a simple range of tools and features to help you search for a soul mate and make new friends.